The Helmeted Basilisk, also known as the Helmeted Iguana, Casque-headed Lizard and Old Man Lizard, is a small, arboreal lizard found throughout Central America. It has a distinct, specialized head “casque,” well-developed in both sexes, with helmet-shaped raised ridges forming a serrated crest along the back of the head and extending onto the neck and back. At an overall length of 36 cm, its laterally-compressed body is 8-12 cm, with a long tail 2 to 2½ times its body length. It has keeled scales over its entire body, and is typically olive to rich chocolate or reddish-brown in color, with some green. Black lines extend from the eyes to the light colored lip. It has very long toes. With a physical resemblance to African chameleons, it cannot be confused with anything else! Helmeted Basilisks are sit-and-wait predators; they remain motionless on small vertical trunks and branches with their head pointed upward, often for hours at a time, capturing prey infrequently. They allow for close approach, and are often catchable. They feed on slow-moving arthropods, particularly caterpillars and beetle larvae, and occasionally small anoles. They will also hunt on the forest floor. They capture prey infrequently. Helmeted Basilisks have some unique anti-predator behaviors. Their first line of defense is camouflage—they can resemble lichen with spots forming on their skin when resting, and can change color rapidly. They freeze their body, making themselves so rigid as to eliminate all minor movements, a behavior called “cataleptic freezing.” If these passive measures fail, they compress their body, erects their crest, expand their gular pouch and bob their head. By doing this, they hope to increase their apparent body size and deter the predator. If all else fails, they will attack and bite ferociously. Breeding occurs throughout the year, and male and female encounters are likely infrequent. Females can store sperm for some time after mating, in order to wait for ideal environmental conditions to lay the eggs, a tactic used by many reptiles and amphibians. The female digs a shallow nest in the ground, 5-10 cm in diameter, and it is thought that the rigid head may be used for nest excavation. Helmeted Basilisks are oviparous, and the female lays 4-11 creamy white eggs with flexible shells, which she covers over with soil. The female defends her nest from predators. Helmeted Basilisks live in undisturbed lowland and premontane rainforests, and are occasionally found in quiet gardens. They are difficult to encounter, and are usually found at night while sleeping on vertical perches. 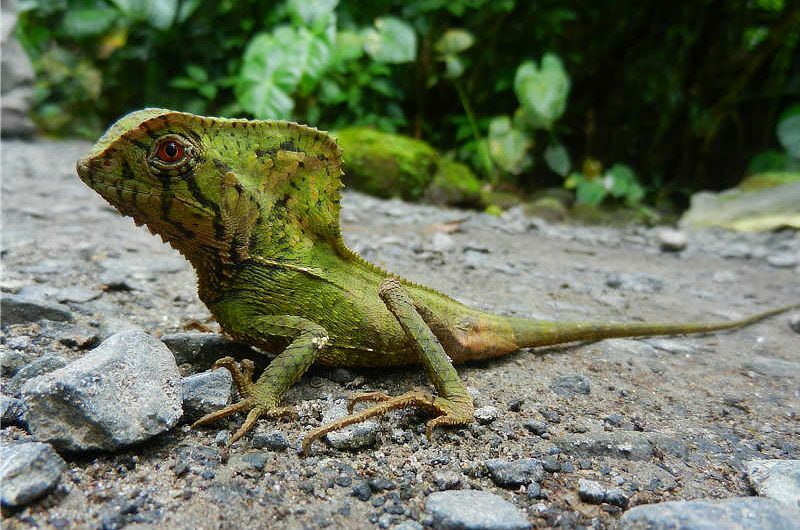 Ranging from Mexico to Bolivia, Helmeted Basilisks can be found around all the Canopy Family lodges in Panama. Home for a plant: On various occasions, Helmeted Basilisks have been observed with moss and small plants growing on substrate on the top of their heads, a sign that movement is infrequent in these small lizards!